The first episode in the Alex McMurray story comes in the wake of a quest for a gig in 1995, McMurray apparently informed the management at a Thai dive bar called the Dragon's Den on the edge of New Orleans’ French Quarter that he had a band, got the gig and therefore needed to find a rhythm section. 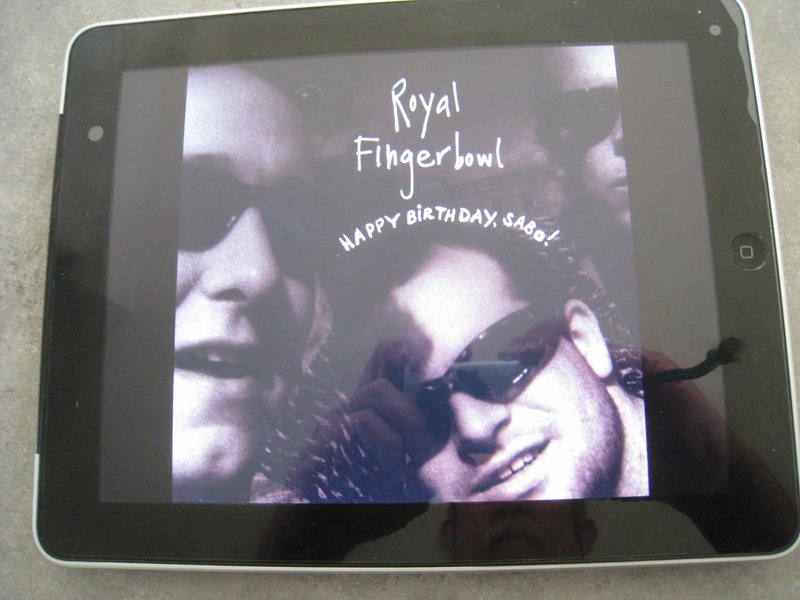 Royal Fingerbowl was, essentially the result, with McMurray’s guitar and vocals supported by bassist Andrew Wolf and Kevin O'Day on drums, both of whom, like the leader, landed in New Orleans to further their educations and ended up exploring the city’s musical traditions. Two years later a demo recorded live during the day time in a deserted club delivered a contract with New York's TVT label, and Happy Birthday Sabo! followed shortly thereafter. Nothing But Time is a tasty opener, delivering a handy primer to some of McMurray’s lyrical concerns but the languid Manahawkin is the first sign that there’s something out of the ordinary on the horizon. There’s a drowsy summertime feel to a song that appears to deal with a kidnapping aimed at recovering lost emotional and financial capital. At least that’s what I think it’s about. McMurray’s songs tend to wrap themselves around some odd ideas. Month of Sundays, for example, isn’t the sort of title you’d associate with your common or garden love song. Which, of course, is fine because McMurray doesn’t write them. You’re so ugly my dog is afraid of you/But I can’t help thinkin’ I want to get next to you, he intones over a marching band brass section and rattling snare drums and before long he’s offering to teach the object of his affections how to do wheelies on her bicycle and we’re obviously talking kiddie for kiddie lust over the long summer vacation. What happened to that dress that I stole for you/and Why can’t you fix your face like I told you to are the opening lines of Big Whiskey, a lethargic roam through Crescent City bars delivered in McMurray’s bourbon soaked drawl while Ozona, TX has an old man in an old house unable to dream an old cowboy dream. There are Homeric references in Rosy Fingered Dawn (McMurray’s background in Literature and Philosophy presumably kicking in there) and an easy shuffle leads into Fistful of Love, a swinging little ditty that’s probably about what you think it is. My Money shuffles along as well, with McMurray specifying what he’ll do when he makes it big and strikes it rich and what Rick Koster describes as a Kurt-Weill-Lives-In-A-Rampart-Street-Flophouse-and-reads-Charles Bukowski approach to tunecraft (Louisiana Music p. 231) continues through Muenchentown, where the Octoberfest oompah backing builds to a feverish cacophonous ending. Runaway psychopath Otis seems to be a recurring character and when Otis Goes Postal the situation is related to something about the moon that ain’t right, and he’s preparing for the Armageddon as the SWAT teams are poised to go into action. Grandiose schemes are the ongoing order of the day in Toby, where someone’s planning to highjack a freight train and drive it to Rio or some such place, and Carny Boy, fairly predictably, takes a look at life in a travelling circus with fairground laughter lurking in the background. It’s a vaguely unsettling touch. Winding things up, Magnets delivers a nine and a half minute meditation on the influences that operate just under the surface of the protagonist’s life, a languid reflection that turns unsettling as McMurray does a reasonable impersonation of a howling wolf. It’s not his fault, it’s those damn magnets. Track by track Happy Birthday Sabo! stacks up pretty well against just about anything I’d be inclined to line up beside it. McMurray’s vocals have a fine low rent rasp to ‘em, while the band locks in behind them in a way that serves the song just right. McMurray’s guitar doesn’t head off into virtuoso extravagance, but it does what it needs to do when it needs to be done, a model of restraint on something like Manahawkin that put me in mind of Steve Cropper on Dock of the Bay. But the greatest strength is the material McMurray are working with. The dude can write, and while things lean musically towards mid-tempo blues and jazz the songs, set in places where the buses might run but services are on the infrequent side of occasional and populated by people who might have heard of mainstream society but haven’t got within cooee of the concept are the real strength.